Welcome to our local lgbt EVENTS & DIARY MONTHLY LISTINGS page. If it's a LGBT event in the Weymouth / Portland / Dorchester / Bridport / Dorset area we should have it listed here! We try to update this page weekly. So please check back here often to ensure you don't miss anything that YOU really wanted to attend! Scroll down to see details of over 30 local lgbt events most months. If you know a local LGBT event not listed tell please us! We get LOADS of hits on our website and promote events on our website and social media. eg - twitter https://twitter.com/WeymouthGayGrp where we have over 1,500 followers! A PC is best way to see us, please pull down all the menus in top blue banner, explore and enjoy all our pages! -join us for friendship / chat / support / laugh / food / drink. Monthly on a Wednesday afternoon - so in April it will be on Wednesday 17th. During 2018 these monthly Wednesday afternoon coffee shop meet ups (on 3rd wed each month) have run at two venues in Weymouth. However sadly both cafes have closed down! So the search is on for another cafe type venue. ...and we have found one! Join us all at The Quayside coffee (Vaughan's Bistro) Weymouth from 2pm. More info below in Monthly Diary Listings. See Events Diary listings below for more info about this Proud Cherries Foolball / LGBT event. Weymouth & Portland Pride - a First! Weymouth & Portland Pride 2019 will be over the weekend of Sat JULY 27th 2019! Plans are well advanced for the first Weymouth & Portland Pride. Click on poster (right) to enlarge. A local Pride committee was established (October 2018) to drive this project froward with key local LGBT people, business and others. Volunteers are being requested by the pride committee now to help out both on the day and before hand. **NOTE** Early bird discounted tickets are available NOW from the Pride website. Dont miss this party below! Note:- Listing is no confirmation event is happening. You are advised to contact organiser before attending. Did you know... in March we listed 32 local LGBT events, 30 in February, 32 in January 34 in December, 34 in November, 34 in October, 40 in September! If you know of a local lgbt event not listed, please tell us, tell everyone! You and your friends may wish to join in! It's great that there is so much going on for LGBT people in our area. Tuesday 2nd Your Local LGBT radio show. Air - All Inclusive Radio, Community Radio 107.2 FM in Weymouth & Portland or online via https://air1072.com/ Presented by Charity Gardiner. 8 - 9pm Chilling with Charity with requests, call the studio 01305 83 60 40 with your favorite songs. 9 -11pm "Lets Get Busy Talking" LGBT hours with Charity Gardiner, local lgbt events & info. As well as a few of your favorite LGBT related tunes, you can call in with a request too. Wednesday 3rd Bridport - Drop in LGBT support group Unitarian Chapel in the Gardens 5pm- 7pm. In reading room via Rax Lane. 49 East St Bridport Dorset DT6 3JX Public Car Parking is opposite in East St car park. Please note:- Listing is no confirmation event is happening. You are advised to contact organiser before attending. Friday 5th MindOut Weymouth. MindOut is a safe, confidential and accepting space for LGB and Transgender people experiencing mental health issues and offers recovery-based peer and staff support. Group Facilitator: Debbie Contact: 07766-281434 or email: mindoutwey@dorsetmind.uk No referral is necessary, you can simply turn up on the day or you can get in touch with Debbie in advance. Meets on the 1st and 3rd Friday of every month, between 2pm – 4pm Address: Weymouth Adult Learning Centre, 45 Dorchester Road. Weymouth. DT4 7JT. Proud Cherries are excited to bring you this unique and exciting event hosted by AFCB to raise awareness on equality and diversity. There will be guests from AFC Bournemouth in attendance. 6pm - Doors Open - There will be organisations with information stalls to take a look at. 7pm - Sophie Cook (first openly transgender person to work in professional football as AFCB photographer) will share some thoughts and welcome you as our patron of Proud Cherries. 7.10pm - Panel Discussion focussing on equality and diversity within football - Sky Sports MARK McADAM to host. ANWAR UDDIN (ex professional footballer, diversity and campaigns manager for the football supporters federation and lead for the 'fans for diversity' campaign). CHRIS PAOUROS (Co-chair of Proud Lilywhites, co-founder of Pride in Football, independent member of the FA's inclusion advisory board, Women in Football and Fans for Diversity guidance group). 8/8.30pm - Stadium Tours - The chance to take a look behind the scenes at AFCB. Walk out the tunnel, take a look at the dressing rooms and more. Attendees to be aged 12+ and under 16's to be accompanied by an adult. Tuesday 9th Your Local LGBT radio show. Air - All Inclusive Radio, Community Radio 107.2 FM in Weymouth & Portland or online via https://air1072.com/ Presented by Charity Gardiner. Wednesday 10th Bridport - Drop in LGBT support group Unitarian Chapel in the Gardens 5pm- 7pm. In reading room via Rax Lane. 49 East St Bridport Dorset DT6 3JX Public Car Parking is opposite in East St car park. Friday 12th MindOut Weymouth. MindOut is a safe, confidential and accepting space for LGB and Transgender people experiencing mental health issues and offers recovery-based peer and staff support. Group Facilitator: Debbie Contact: 07766-281434 or email: mindoutwey@dorsetmind.uk No referral is necessary, you can simply turn up on the day or you can get in touch with Debbie in advance. NOTE - todays meeting is instead of Friday 19th, which is Good Friday. Meets on the 1st and 3rd Friday of every month, between 2pm – 4pm Address: Weymouth Adult Learning Centre, 45 Dorchester Road. Weymouth. DT4 7JT. Sunday 14th OutDoor Lads (ODL) Sport Climbing Portland. "We’ll pick our exact location depending on the abilities of people in the group and the weather conditions on the day. The meeting point is therefore intended as a guide only, and we’ll make more detailed arrangements with everyone signed up closer to the time. This event is one day of a weekend-long event. Please feel free to sign up for the Saturday here. Some of us will look to book into a local bunkhouse - please message the event leader if you'd like to join us." Tuesday 16th Your Local LGBT radio show. Air - All Inclusive Radio, Community Radio 107.2 FM in Weymouth & Portland or online via https://air1072.com/ Presented by Charity Gardiner. Wednesday 17th Bridport - Drop in LGBT support group Unitarian Chapel in the Gardens 5pm- 7pm. In reading room via Rax Lane. 49 East St Bridport Dorset DT6 3JX Public Car Parking is opposite in East St car park. Friday 19th MindOut Weymouth. **Please note**, as this is Good Friday this group will not meet up today. It is meeting up on April 12th instead. Saturday 20th NOTE - this event is NOT running. It may happen later this year, if so, we will put details here on our events diary listings when known. (Easter Saturday) LGBT+ Festival - Dorchester. The Corn Exchange (aka Town hall) This is an event run by The Intercom Trust and Dorset Police with LGBT+ and other community groups. Workshops, key speakers, mental well being, Keeping safe and lots more. Saturday 20th Weymouth & Portland Pride Party at The Closet Bar W&P Pride will be announcing the celebrity headline act appearing at Pride 2019. £4 entry price going towards raising money for the first Weymouth & Portland Pride! Live cabaret act during the evening with ledgendary drag host "Miss Burns". See poster at top of this page. Monday 22nd Allsorts Lesbian Group - Circular Walk from The Royal Oak Cerne Abbas. Tuesday 23rd Your Local LGBT radio show. Air - All Inclusive Radio, Community Radio 107.2 FM in Weymouth & Portland or online via https://air1072.com/ Presented by Charity Gardiner. Please note this message from Tony - "Hi all just to let you all know we won,t be meeting this Wednesday 24th April but will be back next week Wednesday 1st May. We hope your having a lovely Easter break"
Unitarian Chapel in the Gardens 5pm- 7pm. In reading room via Rax Lane. 49 East St Bridport Dorset DT6 3JX Public Car Parking is opposite in East St car park. Tuesday 30th Your Local LGBT radio show. Air - All Inclusive Radio, Community Radio 107.2 FM in Weymouth & Portland or online via https://air1072.com/ Presented by Charity Gardiner. May 33 events ! so far, more events added soon! Did you know... in April we listed 39 local LGBT events, March we listed 32, 30 in February, 32 in January 34 in December, 34 in November, 34 in October, 40 in September! If you know of a local lgbt event not listed, please tell us, tell everyone! You and your friends may wish to join in! It's great that their is so much going on for LGBT people in our area. Wednesday 1st Bridport - Drop in LGBT support group Unitarian Chapel in the Gardens 5pm- 7pm. In reading room via Rax Lane. 49 East St Bridport Dorset DT6 3JX Public Car Parking is opposite in East St car park. Fri 3rd - Mon 6th Gay Caravan & Motorhome Club (GCMC) staying at a rural site near Wareham. Friday 3rd MindOut Weymouth. MindOut is a safe, confidential and accepting space for LGB and Transgender people experiencing mental health issues and offers recovery-based peer and staff support. Group Facilitator: Debbie Contact: 07766-281434 or email: mindoutwey@dorsetmind.uk No referral is necessary, you can simply turn up on the day or you can get in touch with Debbie in advance. Meets on the 1st and 3rd Friday of every month, between 2pm – 4pm Address: Weymouth Adult Learning Centre, 45 Dorchester Road. Weymouth. DT4 7JT. Tuesday 7th Your Local LGBT radio show. Air - All Inclusive Radio, Community Radio 107.2 FM in Weymouth & Portland or online via https://air1072.com/ Presented by Charity Gardiner. Wednesday 8th Bridport - Drop in LGBT support group Unitarian Chapel in the Gardens 5pm- 7pm. In reading room via Rax Lane. 49 East St Bridport Dorset DT6 3JX Public Car Parking is opposite in East St car park. Saturday 11th Jumble Sale in aid of Space Youth Project See poster at top of this page. 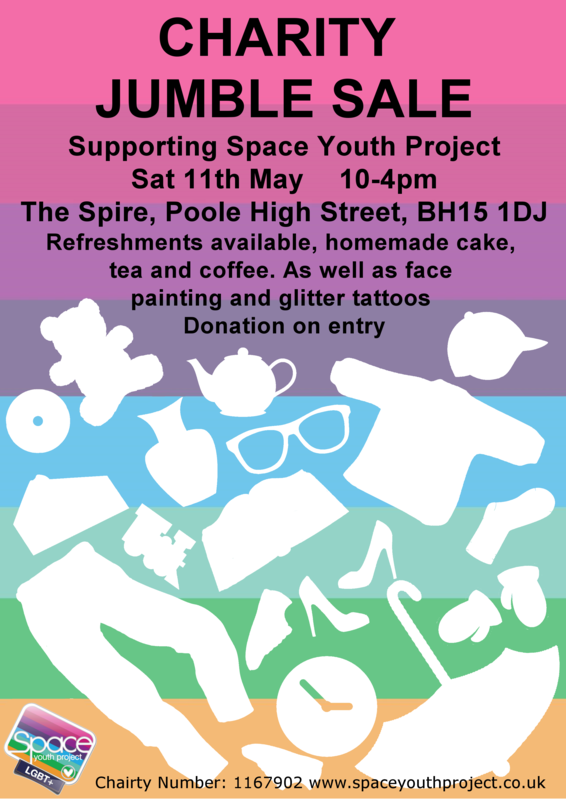 The Spire, Poole High Street BH15 1DJ Refreshments available, home made cake, tea & coffee, as well as face painting and giltter tattoos. Donation on entry. 10pm - 4pm. Tuesday 14th Your Local LGBT radio show. Air - All Inclusive Radio, Community Radio 107.2 FM in Weymouth & Portland or online via https://air1072.com/ Presented by Charity Gardiner. Wednesday 15th Bridport - Drop in LGBT support group Unitarian Chapel in the Gardens 5pm- 7pm. In reading room via Rax Lane. 49 East St Bridport Dorset DT6 3JX Public Car Parking is opposite in East St car park. Wednesday 15th Julian Clary at The Lighthouse Poole. Friday 17th MindOut Weymouth. MindOut is a safe, confidential and accepting space for LGB and Transgender people experiencing mental health issues and offers recovery-based peer and staff support. Group Facilitator: Debbie Contact: 07766-281434 or email: mindoutwey@dorsetmind.uk No referral is necessary, you can simply turn up on the day or you can get in touch with Debbie in advance. Meets on the 1st and 3rd Friday of every month, between 2pm – 4pm Address: Weymouth Adult Learning Centre, 45 Dorchester Road. Weymouth. DT4 7JT. Tuesday 21st Your Local LGBT radio show. Air - All Inclusive Radio, Community Radio 107.2 FM in Weymouth & Portland or online via https://air1072.com/ Presented by Charity Gardiner. Wednesday 22nd Bridport - Drop in LGBT support group Unitarian Chapel in the Gardens 5pm- 7pm. In reading room via Rax Lane. 49 East St Bridport Dorset DT6 3JX Public Car Parking is opposite in East St car park. Tuesday 28th Your Local LGBT radio show. Air - All Inclusive Radio, Community Radio 107.2 FM in Weymouth & Portland or online via https://air1072.com/ Presented by Charity Gardiner. Wednesday 29th Bridport - Drop in LGBT support group Unitarian Chapel in the Gardens 5pm- 7pm. In reading room via Rax Lane. 49 East St Bridport Dorset DT6 3JX Public Car Parking is opposite in East St car park. June We are expecting to list over 35 events for you to enjoy! Here are a few, more soon. June 7th - 9th Summer Camp and Multu-Activity Weekend - Swanage Hosted by Bournemouth Gay Men's Social's. For divers who love wrecks, we are offering 2 days RIB diving out of Portland to the wrecks of Weymouth. We will be diving with Dive Beyond. The tides are perfect to reach those wrecks we often don't get to do. Provided the weather holds we can visit the M2, Aeolian Sky and Frogner this weekend. RIB diving is more flexible and means we can come back between dives. You will need be have Advanced Open Water certification or above and a minimum of 50 UK dives. All the deep dives are within the 30m range, but the bottom of some of the wrecks go deeper than this. Air or Nitrox are both available. June 9th Gay OutDoor Club (GOC) Walk. Badbury Rings and Kingston Lacy. A moderate 9 mile walk across rolling woodland and farmland; descending from the Wessex Ridgeway down the valley to the picturesque village of Milton Abbas; returning via Milton Abbey School to ascend Bulbarrow Hill. June 11th Your Local LGBT radio show. Air - All Inclusive Radio, Community Radio 107.2 FM in Weymouth & Portland or online via https://air1072.com/ **Special programme** - about teaching LGBT issues in Schools. June 22nd Chesil Rocks. This popular annual local music festival is in aid of Samaritans of Dorset. The London Gay Men's Chorus have performed here during the last few years, and are booked to return! June 30th Gay OutDoor Club walk Jurassic Coast: White Nothe Cliffs and Chaldon Herring A 9 mile stroll along the Jurassic Coast from Durdle Door to White Nothe Cliffs returning along Chaldon Herring's downland ridge with two climbs. The steep cliff undulations will be avoided but remain an option for those wanting a challenge! July 3rd Ian McKellen at The Marlne Theatre Lyme Regis Ian McKellen is appearing in person, on stage at the Marine for a very special fundraiser. Limited tickets are also available for an intimate drinks reception with Sir Ian. July 27th Weymouth & Portland's first Pride! 3 days of events. Know a LGBT event not listed? Tell us tell everyone! We get a HUGE number of hits on our website. Our events listings are also read out on Weymouth's local LGBT radio show "Lets Get Busy Talking" on AIR Radio 107.2 FM & online, Tuesdays 9-10pm by presenter Charity Gardiner. Please note:- Listing is no conformation event is happening. You are advised to contact organiser before attending. Weymouth Pop Up (a partnership with & for the local LGBT community, partly funded by a Weymouth & Portland grant, started in February 2018). Every third Wednesday in the month 2 – 4pm New venue - The Quayside coffee (Vaughan's Bistro) Weymouth from 2pm. More info in above Events Diary listings. Please note - It's been sad to hear that the Bridport LGBT Group (previously known as Diversity Bridport) has closed. They have been running during the last year with pub meet ups at The Woodman Inn and Ropemakers pub. Plus monthly cafe meet ups at The Beach & Barnicott (jointly organised with the Dorset LGBT Equality Network). Annabelle, from the group, is still keeping the Bridport LGBT Group Facebook page going, but may close it at some point. Local LGBT radio show. Air - All Inclusive Radio. Community Radio in Weymouth & Portland 107.2 FM in Weymouth & Portland or online via https://air1072.com/ Presented by Charity Gardiner. Chilling with Charity 8pm- 9pm, "Lets Get Busy Talking" LGBT with Charity 9pm-11pm with local lgbt events & news. DnE's brilliant (transgender) song "Lights" starts the LGBT hours at 9pm. Gay Table Roast Dinner and Coffee mornings - Although slightly outside our area, these two excellent social events run by Paul in Stoford (just south of Yeovil off the A37) are ideal for guys in North Dorset who may feel socially isolated. Coffee mornings Second Saturday in the month from 11am – 3pm Stoford near Yeovil. We also list events from visiting lgbt groups to Dorset (if we know about them), these include Gay & Lesbian Underwater Group (GLUG), OutDoor Lads (ODL), Gay Caravan and Motorhome Club (GCMC), Gay OutDoor Club (GOC) and others. You may need to join these groups to take part in their events, but some are open to guests. Bourne Free - Bournemouth Pride 13th July 2019. A local Pride committee was established (October 2018) to drive this project froward with key local LGBT people, business and others. Volunteers are being requested by the pride committee now to help out both on the day and before hand. **NOTE** Early bird discounted tickets are available NOW from the Pride website. Know a LGBT event not listed? Tell us tell everyone! We get a HUGE number of hits on our website. Our events listings are also read out on Weymouth's local LGBT radio show "Lets Get Busy Talking" on AIR Radio 107.2 FM & online, Tuesdays 9-11pm by presenter Charity Gardiner. We also plug local lgbt events on our Twitter (over 1,480 followers!) & Facebook pages. 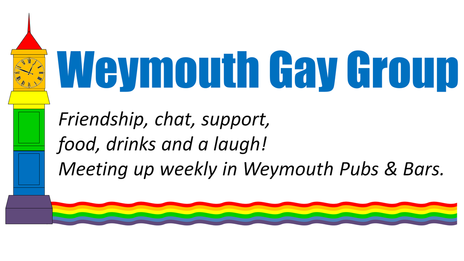 Please make sure you check out all our other pages, lots of local lgbt events, local lgbt news, helplines and info on Weymouth & Portlands first Pride event too!